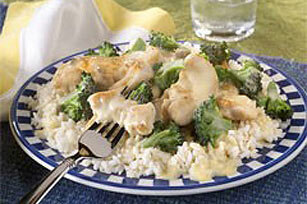 Serve this cheesy, creamy and saucy chicken and broccoli recipe over rice! This Easy Rice, Chicken and Broccoli recipe is an easy, family-pleasing meal. Spray skillet with cooking spray. Add chicken; cook and stir on medium-high heat 4 to 5 minutes or until cooked through. Add VELVEETA, soup, milk and broccoli. Reduce heat to low. Cook until VELVEETA is melted, stirring occasionally. Spoon chicken mixture over rice. Substitute 2 pkg. (6 oz. each) OSCAR MAYER Deli Fresh Grilled Chicken Breast Strips for fresh chicken. Cook and stir chicken breast strips, prepared cheese product, soup, milk and broccoli until heated through. Serve over rice.